Patient is a 11 yr old, FS, German Shepherd Mix with a 4-month history of coughing that improves while she is on antibiotics. Tracheal wash: epithelial cell hyperplasia with suppurative and septic inflammation. Patient was anesthetized and a pre contrast CT scan of the thorax was performed. Afterwards, Omnipaque ™ (contrast agent) was administered IV and a post-contrast study of the thorax was acquired. 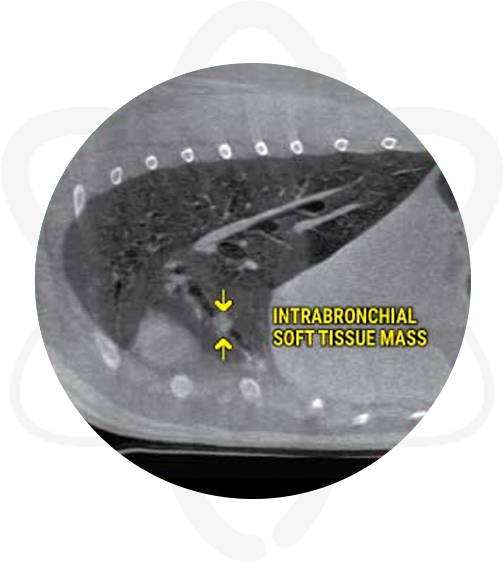 CT found a mass that was missed on radiographs which explain the history of the cough and made a difference in the outcome by providing valuable information for surgical planning. CT is the best imaging modality for the evaluation of many intra-thoracic diseases, such as bronchial obstruction, lung lobe torsion and pulmonary thromboembolism among others. 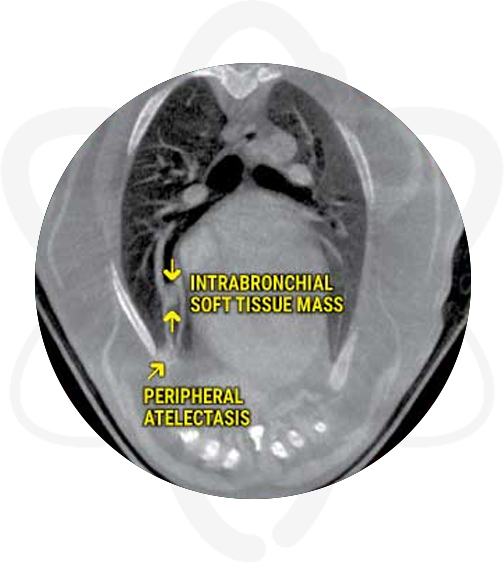 In addition, this modality is preferred when assessing pulmonary parenchyma for metastatic disease (nodules are detected at 1-2mm in size in CT vs. 7-9mm in radiographs) as well as evaluating the mediastinum (lymphadenopathy, vascular anomalies, etc).